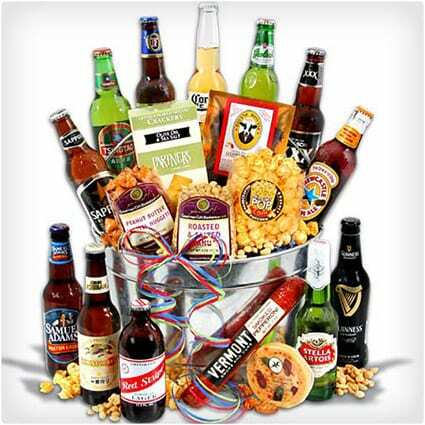 Support a friend or family member’s love of beer by giving them one of these cool gift baskets! 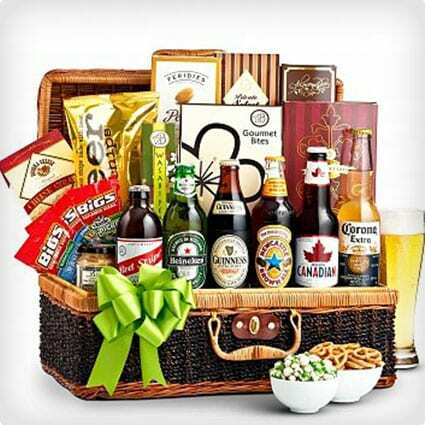 Not only do they include items that you would expect, such as bottles of beer and tasty snacks, many of these baskets also contain fun items, like beer soap, beer barbeque sauce, beer candy, and more! Nothing goes together quite as well as the perfect beer and barbequed food! In addition to containing six sensational beers, this bucket also includes barbeque favorites like steak sauce, meat rubs, popcorn, and more. This bucket makes the perfect gift for the man in your life who loves to grill. No football game is complete without a frosty beer! This cool gift bucket contains items like beer chips, snack mixes, and popcorn, but it also comes with a six pack beer cooler. The best part is, the gift basket can be customized with the logo of the recipient’s favorite team! Great beers are often paired with great food. Marry the two with these tasty beer-based sauces and mustards! The gift pack includes items like wing sauce, barbeque sauce, and a porter based mustard that are sure to compliment a variety of snacks and grilled meats. Beer isn’t just for drinking! Not only does beer provide a unique scent in the shower, it also provides a dry bar of soap with moisturizing properties. 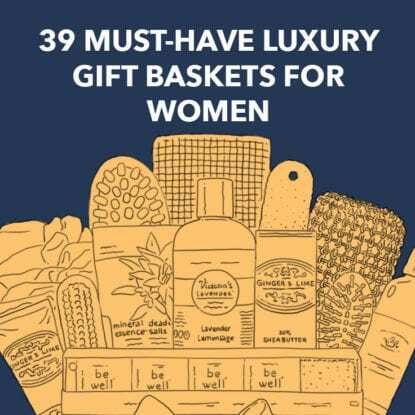 This basket contains your choice of scented beer soaps, as well as lip butter, healing salve, and more that makes the perfect gift for both men and women. New York is known for great sports and delicious beer, and no brewery does beer better than the Brooklyn Brewery. This basket contains four signature Brooklyn beers, in addition to snacks like chips, pretzel nuggets, and popcorn that perfectly pair with each beer. Taste the world’s beers from the comfort of your home with this world beer bucket. With 12 beers, a friend or loved one will be able to taste the flavors of Ireland, Mexico, Canada, and more. This basket comes complete with tasty snacks like summer sausage and salami. 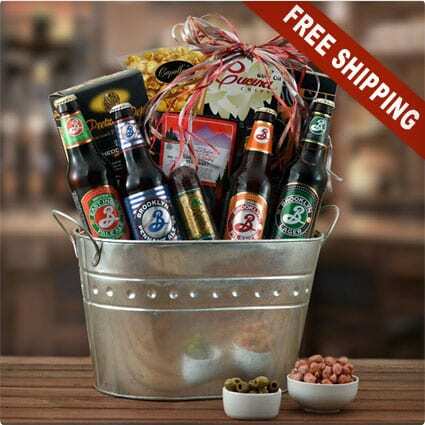 If you know someone who loves to relax in the evening with a delicious beer, they are sure to love this gift basket! It includes unexpected snacks like sunflower seeds, corn nuts, and almonds, but the beer choices can also be customized to match your tastes. The Northwestern United States is known for handcrafted treats, delicious snacks, and tasty beverages. This beer gift basket is unique because it is appropriate for all ages. Instead of containing alcoholic beers, it contains Thomas Kemper root beer, in addition to a variety of other yummy snacks. Having a hard time finding a gift for the beer lover in your life who has a sweet tooth? Skip the basket and choose an unexpected gift instead! This bouquet contains six freshly baked cookies that have been frosted to resemble bottles of Coors Light. Being a fan of beer means willing to be adventurous. Give a friend or family member the opportunity to taste a unique beer with this Anchor Steam Aweigh gift basket. It contains multiple bottles of Anchor Steam Porter, as well as tasty snacks that are perfect for sharing. Fool a friend or loved one with this cool candy gift basket. It contains an actual beer mug that is made to look like it’s full of beer, except instead of beer, the cool double paned beer mug is full of beer flavored jelly beans! Beer and cheese go hand in hand, so it should be no surprise that some of the best artisanal cheeses use beer as their main ingredient. This unique cheese box contains four unique cheeses that contain stout, ale, and more. This basket is the perfect gift for the beer lover who enjoys being social while drinking a brewski. It includes the great snacks that you would expect from a high-quality gift basket, but it also includes cups and ping pong balls so they can start a friendly game of beer pong. When you’re ready to give a memorable gift, make sure it contains award winning items. This basket contains international favorite brews in an eye-catching metal bucket that can be used again and again. The basket comes complete with pistachios, rosemary garlic crispbread, and almond roca. Some of the coolest gift baskets come in a bucket! This bucket of microbrews contains your choice of beers that include Samuel Adams Seasonal, Sierra Nevada Pale Ale, Magic Hat #9, Traveler, and others. Of course, this tasty bucket also contains popular pub snacks. Looking for a unique way to enhance a friend or loved one’s breakfast experience? This beer jelly three pack should do the trick! These yummy jellies come in flavors that include India pale ale, green mountain ale, and apricot ale. Beer and bacon, it doesn’t get any better than that! Although this basket doesn’t contain actual beer, it does contain beer nuts and draft jelly beans, in addition to a whole slew of bacon flavored items like bacon habañero chips and bacon hot sauce. Encourage the cook and beer lover in your life to experiment with unique sauces on the grill. These handcrafted beer barbeque sauces even come with fun vintage labels! Flavors include brown sugar, teriyaki, chipotle, and more that complement grilled meats perfectly. Sriracha is gaining in popularity, which means you’ll likely find Sriracha and Sriracha flavored snacks at your favorite bar. Incorporate this popular hot sauce into a unique gift that includes Sriracha chili popcorn, sugar plum Sriracha peanuts, and two glass beer steins. This simple basket is a great gift for birthdays, anniversaries, and other celebrations because it contains tasty beers and gourmet treats. The unique beer choices in this basket include Bass Ale, Heineken, Guinness Extra Stout, Murphy’s Irish Amber, and Dos Equis. Incorporate more beer into your friends’ and loved one’s lives with this stout and coffee soap recipe. Used coffee grounds provide an exfoliating effect, while Guinness adds a unique smell and texture to this luxurious soap that is sure to become a bath time favorite. There are plenty of women who love beer too! Shake things up and create these cool beer bath bombs. They contain ingredients that you can probably find around your home, like corn starch and beer. They’re so luxurious that the men in your life will want to soak in a bath too! Drinking beer usually means getting stuck with a bunch of glass beer bottles that look cool, but aren’t very functional. This tutorial shows you how to cut beer bottles using cotton yarn, nail polish remover, and ice water. Once cut, they make the perfect candle holders! Skilled with tools? Looking for a unique project? Give this patio table with built-in beer coolers a try! Although you can build the table from scratch, you can also try purchasing a table and altering it to accommodate the beer coolers instead.